Known to court controversy and get some free publicity, AIMIM leader Asaduddin Owaisi today gave the Jallikattu issue a communal twist. In a tweet, he said the protest is a lesson for Hindutva forces and that the Uniform Civil Code cannot be imposed. He implied that the BJP has been trying to ban jallikattu or the traditional bull-sport in order to implement a Uniform Civil Code. Owaisi is either downright ignorant and dumb or has not updated himself. It is not the BJP government that has banned jallikattu but the Supreme Court. We wonder if Owaisi really studied law from London. And like Kejriwal amd Mamata, he must stop blaming Narendra Modi for everything on earth and universe. 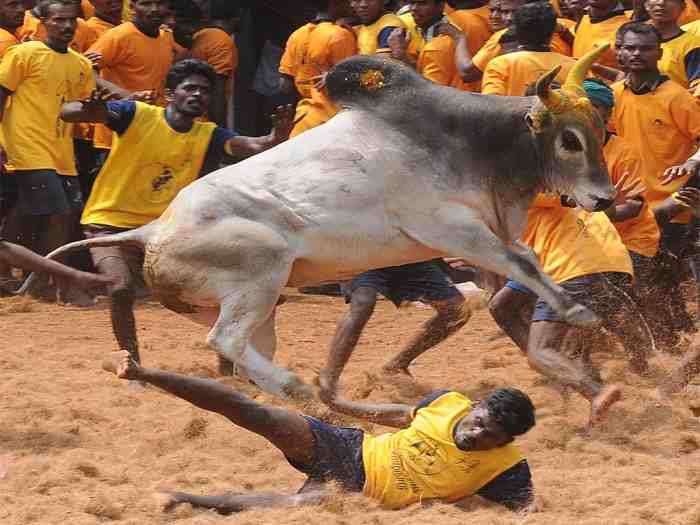 The Centre has always been supportive of jallikattu sport in Tamil Nadu. And Mr Owaisi, you must focus on the ills in the society around you. Triple talaq, for example, is an abhorrent practice and does not have a place in a civilised and modern society. Try to ban that before commenting on bulls. Comment on issues that are plaguing the people in the Old City of Hyderabad and try to free women from suppression. Mr Owaisi, if you had tweeted to get some publicity, you failed to hit the bulls eye. You just got some very cheap publicity instead. Next articleJallikattu- Can Tamil Nadu Bulls Run on Anti-India Slogans?